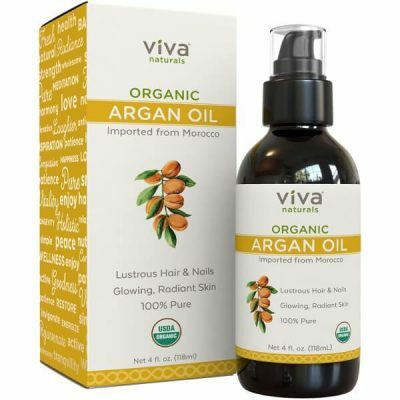 Whether it’s for skin or hair, Viva Naturals Organic Moroccan Argan Oil provides moisture and nourishment. It conditions skin and hair to give long-lasting moisture. 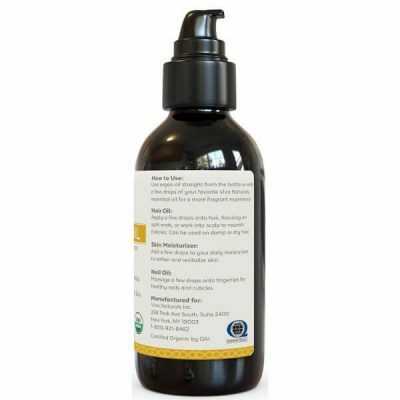 Good skin care products like this nourishing oil is rich in essential fatty acids, vitamins, and minerals. These nutrients are necessary for maintaining the firmness of the skin and the silkiness of hair. The essential fatty acids in Argan oil leaves hair smooth, soft, and silky. It hydrates hair from roots to tips to improve its shine and texture. It tames frizziness and flyaways without making hair oily to the touch. Argan oil prevents brittleness as well and restores the strength of hair to prevent split ends. 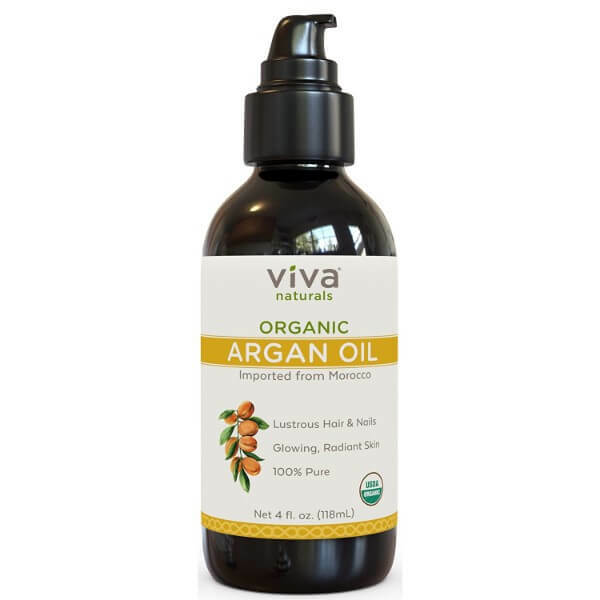 Argan oil’s nutrients keep skin firm and soft as well. The essential fatty acids protect skin from dehydration while the vitamins slow down skin aging. Vitamins A and E are potent antioxidants that help retain the youth of the skin. 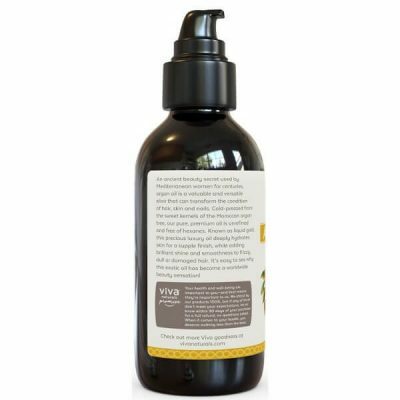 Viva Naturals Organic Moroccan Argan Oil fade skin blemishes while making the skin look younger and healthier. Viva Naturals produced this oil from high-quality raw ingredients. Made from the kernels of Argania Spinosa tree nuts, the oil has gentle nourishing properties for nails too. Strengthen nails and nourish cuticles to keep it from getting brittle. It is gentle for daily use and effective in nourishing the body from head to toe. Unrefined Argan oil packs healing effects that help skin and hair recover from damage. Using fillers dilutes the effects of the oil. Viva Naturals Organic Argan oil does not contain any fragrance or hexane. Add the oil to bath and body products or apply it directly to skin, hair, and nails. A few drops of Argan oil goes a long way to moisturize skin and hair. Use it as a leave-in conditioner or as a styling agent. Revive the hair and rejuvenate the skin with Organic Moroccan Argan Oil. Made from 100% Argan oil. Cold-pressed and unrefined Argan oil. Provides vitamins and minerals to keep skin healthy and young. Strengthens nails to prevent brittleness. Leaves a smooth and soft texture after application. Use a small amount of Argan oil and put on hands. Rub palms together to warm the oil. Apply to skin to provide moisture and prevent dryness. It is best used at night after shower. To use as a leave-in conditioner, apply a small amount of oil on damp hair. Start from the midlength to the tips of hair and massage. Use as a styling agent on dry hair to tame frizziness and flyaway.